What Is a Kosher Delicatessen? Pastrami sandwich from a kosher delicatessen. A kosher delicatessen is an eating establishment that handles food according to Jewish dietary law. Practices common in a kosher delicatessen may include sourcing meat and dairy products from kosher suppliers, offering prepared food items that adhere to Jewish law, and storing and preparing all food in accordance with kosher traditions. Kosher delicatessens are popular throughout the United States, and are associated with many signature dishes. Kashrut, or the Jewish system of laws that deals with food preparation, is an extensive body of guidelines that combines nourishment with spiritual well-being. Certain types of animal, such as pigs, rabbits, and rodents, are banned from consumption entirely, while certain organs of permitted animals may not be consumed. One of the key requirements is the total separation of meat and dairy products; these foods must be stored separately and prepared with different utensils, and are not served together as part of one meal. To run a fully kosher delicatessen, owners must not only follow preparation and serving guidelines, but must also carefully source their products. Since kashrut lists specific guidelines on the slaughtering of animals, meat must be purchased from slaughterhouses that adhere to kosher rules. Though any fruits and vegetables are generally considered acceptable, a kosher delicatessen must be careful to buy wine and grape products that are processed by kosher vineyards and wine producers. Many kosher delis are run by Jewish families, but any establishment can be kosher if it chooses to keep to kashrut guidelines. Some of the foods commonly associated with kosher delis have gained world wide fame over time. Latkes, fried potato pancakes, are often served with applesauce or sour cream. Kugel, a heavy, creamy noodle-based dessert, is similar to a bread pudding in taste and texture. 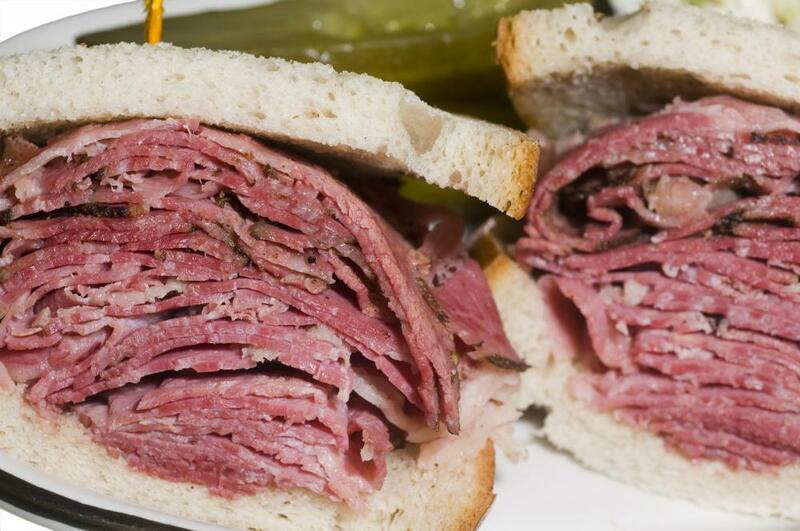 Large, meaty sandwiches featuring tongue, pastrami, or hot roast beef are a staple of nearly any kosher deli. Eastern European and Russian culinary traditions exert a strong influence on much of the food available at a classic kosher delicatessen. Though kosher delicatessens are inextricably linked to Jewish traditions, not all food products or delis that claim to be Jewish actually keep kosher. Many delis offer some kosher products, such as prepared foods and sauces, but do not uniformly follow preparation or sourcing guidelines. Some regions allow delicatessens to become certified as kosher, while in others the term may not be regulated. If there is doubt about a deli's status, it may be best to ask a manager or owner for clarification. What Does a Certified Dietary Manager Do? How Available Is Kosher Food? What Is a Kosher Restaurant?